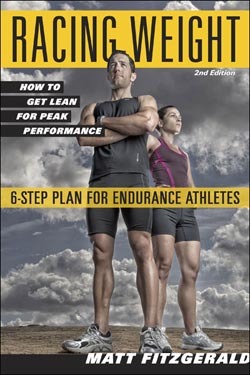 Certified sports nutritionist and best-selling author Matt Fitzgerald has updated his proven weight-management program for athletes in the new second edition of Racing Weight: How to Get Lean for Peak Performance. Three out of four endurance athletes are concerned about their body weight because they know that excess fat hurts their performance. Now endurance athletes can hit their fastest race weight with the best-selling weight-loss plan for cyclists, triathletes, runners, and swimmers. Racing Weight, 2nd Ed. is now available in bookstores; bike, triathlon, and running stores; and online. Preview the book and find weight loss tips for athletes at the all-new website www.racingweight.com. Being lean offers endurance athletes a powerful performance advantage. Among elites, studies have shown that the fastest athletes are the leanest. Lean athletes conserve energy, dissipate heat faster, and even gain more fitness from every workout. But dieting is dangerous for athletes, harming their training and actually worsening their fat-to-muscle ratio. Racing Weight is the comprehensive weight-management plan designed specifically for athletes. Racing Weight is based on the latest science-and the best practices of elite athletes. Six simple steps will get athletes to their fastest weight. Athletes will estimate their off-season and race weights and begin the Racing Weight program to hit their numbers on the scale and on the race course. The Racing Weight plan shows athletes how to improve diet quality, manage appetite, balance energy sources, time meals and snacks, easily monitor weight and performance, and train to get-and stay-lean. The new edition of Racing Weight offers improvements to practical tools that make weight-management easy. Fitzgerald's no-nonsense Diet Quality Score improves diet without counting calories. A new chapter on Racing Weight superfoods suggests diet foods high in the nutrients athletes need for training. Supplemental strength training workouts can accelerate changes in body composition. Daily food diaries from 18 pro athletes reveal how the elites maintain an athletic diet while managing appetite. Athletes know that every extra pound wastes energy and hurts performance. With Racing Weight, cyclists, triathletes, and runners have a simple weight-management program and practical tools to hit their fastest weight. Matt Fitzgerald is the author of numerous books on running, triathlon, nutrition, and weight loss. He has been a contributor to Men's Fitness, Men's Health, Outside, Runner's World, Bicycling, Running Times, Triathlete, Inside Triathlon, Women's Running, and other fitness publications. Fitzgerald is a featured coach on Training Peaks, Active.com, and PEAR Sports. He is a certified sports nutritionist (CISSN) licensed by the International Society of Sports Nutrition. He lives and trains in San Diego, California. For more information, please visit www.mattfitzgerald.org. VeloPress publishes training, nutrition, and history books on cycling, triathlon, and running. See more VeloPress books and download previews at www.velopress.com.